Top sporting talent across the Galloway area were recognised at the 15th Wigtownshire Sports Council’s sports personality of the year awards last week. In total 14 accolades were handed out to a diverse range of sports and athletes. Whithorn boxer Tyler Jolly was named the senior male personality after an impressive 12 months for the welterweight fighter. Tyler, who fights out of Bravehearts boxing club in his hometown in Dumfries, won Scotland’s only boxing gold medal in the Youth Commonwealth Games in the Bahamas and also won bronze in the GB Championships last May. Tom Jolly, his uncle and experienced coach at Bravehearts, won coach of the year after Tyler and Connal McDonald represented Scotland. Willie Martin – the driving force behind the club – picked up an award for his services to the sport. Boxer Kian Govan won the male junior under 14s award after winning the Western District 50kg category, Scottish Schoolboy Open Championship and Hull Box Cup. Martial arts fighter, of Stranraer Muay Thai, Louise King was senior female of the year. Louise, from Stranraer, narrowly lost out on the British title by a single point in a fight she had two weeks’ notice for but won her other fight in an unanimous points win. Senior team of the year was Newton Stewart Rugby after winning the West of Scotland League 1 title last year and they are in contention for promotion from National League Division 3. 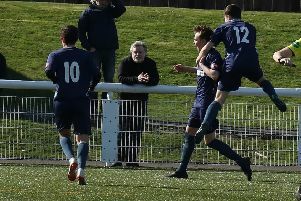 Newton Stewart Football Club’s honourary president Andy McClymont was recognised for his service to local sport being an “indispensable” member of the team. Kilmarnock footballer Josh Rennie won the 14+ category in the male Juniors after a trial with the national team at U16s level and other successes. Stranraer Stingrays have been making big strides in the pool and were recognised as club of the year. Achievements include four swimmers qualifying for Scottish Schools Championships and a medal haul of 55 medals in the regional qualifiers for Dumfries and Galloway. Tetrathlon and triathlon youngster Emma Donnan won the 14+ category in the female Juniors section, Ice Skater Amy Wallace won the under 13 female Junior award. The Junior team award went to curlers Robyn Munro and Niall Ryder. John McClelland was recognised as the sports personality in the disabled category after he was picked for the Great Britain Team in the Hansa Dingy 303 Class to compete in the World Championships in France. John also enjoys Clay Pigeon shooting and plays wheelchair curling at Stranraer. Volunteer of year was Cilla Strain. The retired PE specialist plied her trade in Wigtownshire schools and is involved with the Douglas Ewart High School after school Badminton club, who had players going on to the nationals in Perth under her tutelage.